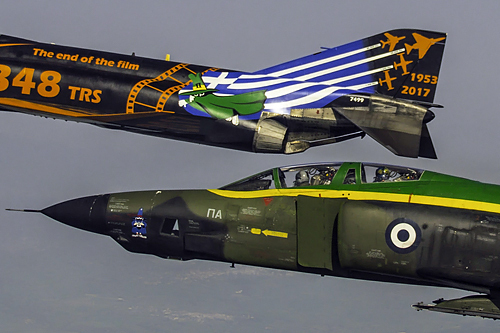 On friday may 5th 2017, the Hellenic Air Force bid farewell to the McDonnell Douglas RF-4E Phantom II. 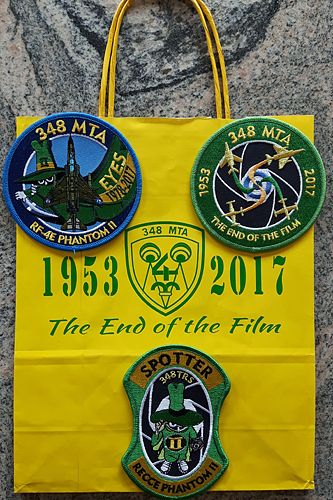 The day before, 348MTA, the unit operating the last reconnaissance Phantoms, organized a shooting day for all Phantom Phriends. That day was blessed with sunny weather and the opportunity was given to photographers to take pictures on an operational air base, which is exceptional in Greece ! 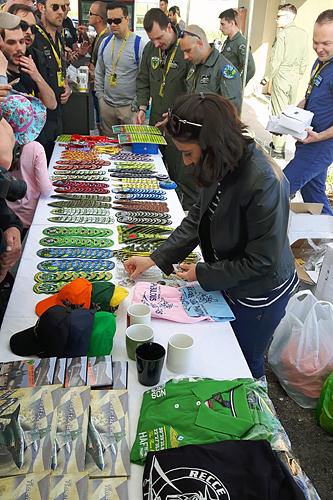 At first, the organizers put the limit at 300 persons but, in about three days, the applications reached more than 500 ! Finally, the number of registered guest was set at 602, of whom 514 joined the event. The no show of the Tornado's was due to a birdstrike that forced them to cancel their participation at the very last moment. The schedule was originally planned for the spotters eyes but, rules are rules, and the orders are to be followed. The final profile was not the 348MTA decision. We must also take into account that the organizers are operational HAF pilots, they are no professional airshow organizers, but they did their very best to give the photographers what they came for : pictures ! Most important, all three Phantoms were able to fly twice on the special shooting day and for the ceremony on friday, no ground abort, no technical issue preventing them from flying for a last time ! Greece and Turkey joined NATO on february 18th 1952. The neighbouring countries to the north (Albania, Yugoslavia and Bulgaria) were already on the Soviet Union side. At that time, the Royal Hellenic Air Force had a limited photo reconnaissance capabilitiy using some Spitfire MkIX and MkXVI. 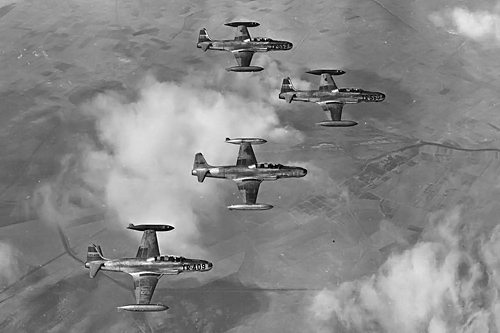 The acquisition of F-84G fighters in 1952 allowed a first modernization. At least nine of those were able to carry a K24 camera in a modified left wingtip tank, the camera being either set in a forward or oblique mode. 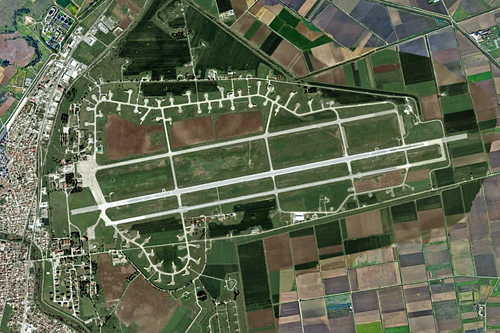 On one of the first operational missions, F-84G " 052 " departed Elefsina to photograph the bulgarian air force base at Kumaritsa from a height of 20.000 feet. The flight lasted one hour and forty minutes and saw no enemy opposition. 348TRF was being formed, as part of 112 Combat Wing, with the mission of providing information not only to the air force but also to the army and navy. In july 1954, 348TRF was redeployed to 110 Combat Wing and Larissa became the homebase of HAF photo reconnaissance aircraft until nowadays. The use of the F-84G(R) by 348TRF was not intended to last for a long time. 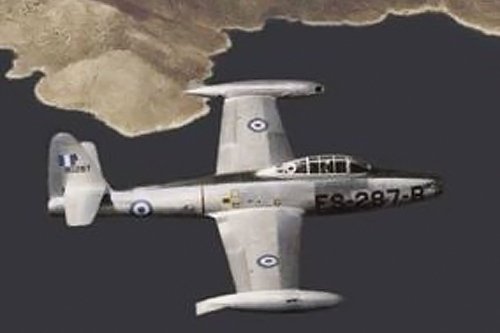 In the spring of 1955, the flight started receiving the first examples of a real photo reconnaissance aircraft, the RT-33A which was the reconnaissance version of the Lockheed T-33A jet trainer. The aircraft had a nose redesigned to carry photographic equipment. The rear cockpit was occupied by an additional fuel tank with a capacity of 165 gallons on top of which were a UHF AN/ARC-27 tranceiver and an AN/ANR-6 radio compass. On april 27th 1955, the flight was upgraded to squadron status, becoming the 348TRS. The squadron received 22 RT-33A aircraft. 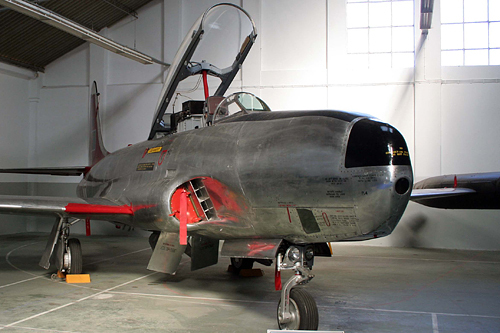 All aircraft were flown in their bare metal finish and without national insigna. After being replaced by the RF-84F, the RT-33A soldiered on until the spring of 1959, flying with 112 Combat Wing, in a target towing and liaison role. At the end of july 1956, 348TRS started re-equipping with the legendary RF-84Fs. 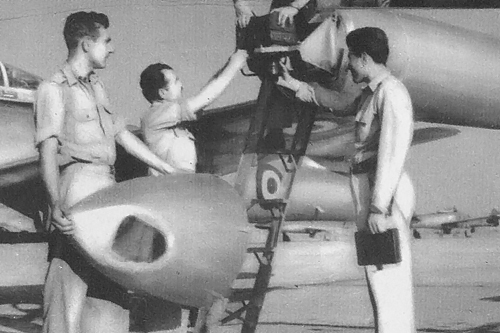 The nose of the aircraft was equiped with no less than six cameras for forward, vertical and oblique photography. The RF-84F was armed with four 0.50 cal machine guns and was usually flown with two large 540 gallons external tanks. In august 1964, as the situation between greeks and turcs was worsening on the freshly independant island of Cyprus, a detatchment of 6 RF-84Fs was sent to Souda, in Crete. On each mission, as the aircraft approached Cyprus, they were intercepted by RAF Lightnings operating from Akrotiri. In july 1974, Greece and Turkey were on the brink of military confrontation because of the turkish invasion of Cyprus. 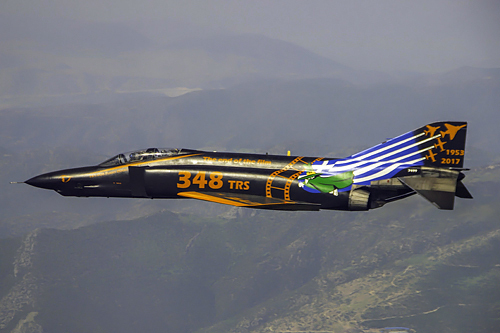 Once again, 6 RF-84Fs were deployed but to Athens this time, operting from Hellinikon airport. Their mission was to take photos of the ships, landing crafts and troop concentrations on the coast, flying at very low level. A much more pleasant and much less dangerous mission was to take photos of all tourist attractions and sites of interest. In the mid 80's, the squadron was tasked to photograph the whole of Greece to reveal the arbitrary buildings, That mission took a whole month to complete ! The Thunderflash lacked modern electronics, it was only equipped with a radio compass, a radio altimeter, a TACAN and an IFF. In early september 1978, Larissa started preparating works for the reception of a new aircraft : the McDonnell Douglas RF-4E Phantom II. 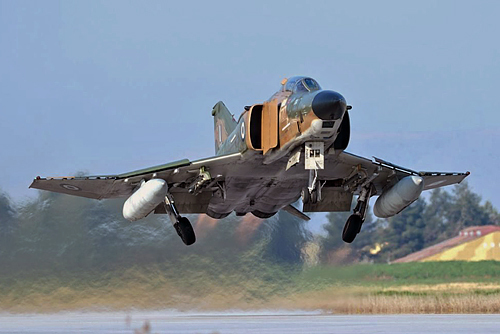 The very first RF-4Es, s/n 77-1761, landed in Larissa on november 3rd 1978 at the end of a 3-day trip from Saint-Louis, home of the manufacturer. All eight jets were delivered with american pilots in the front office and a greek pilot in the back. In 1980, the RF-4Es were declared fully operational. A few years later, they were equipped with the DIAS self-protection suite. The arrival of the RF-4Es changed the role of the squadron as the KS-127A LOROP camera allowed a more strategic " stand off " role. The new squadron operating the newly arrived RF-4Es did not merge with the existing one and remained an independent unit under the command of 110CW. His mission was to train the crews coming from RF-84F and other F-4E units. 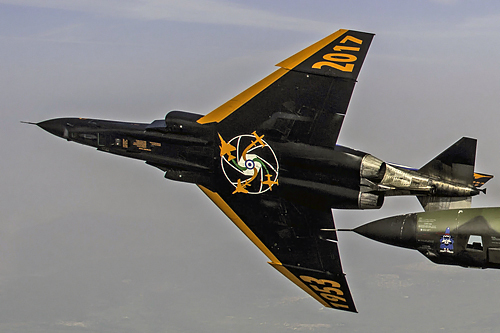 The merging of the two squadrons was completed in july 1987 with the RF-84Fs and RF-4Es operating side by side. On march 29th 1991, the venerable RF-84F was retired from active duty after a 35-year career. At that time, three RF-4Es had been lost in accidents and there was a need to increase the number of jets. 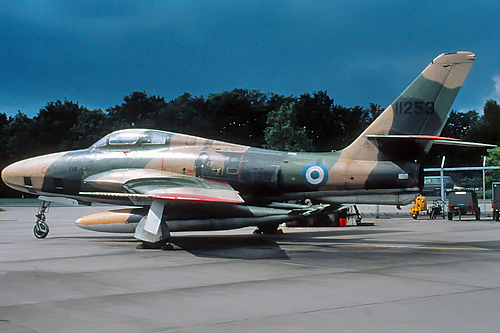 With the end of the cold war, Germany decided to retire her RF-4Es and 27 of them were bought by Greece, the first jets arriving at Tanagra in may 1993. Of the 27 " new " RF-4Es, 20 were incorporated by 348MTA, the remaining seven being used for spare parts. The main differences between the ex-Luftwaffe aircraft and the original airframes is that they lacked RWR and the ability to fire AIM-9s. In 2003, 348MTA started SIGINT missions using the french build ASTAC (analyseur de signaux tactiques) pod. The ASTAC system was carried on the centerline pylon and provided accurate positioning of emiters in ranges up to 500 miles. 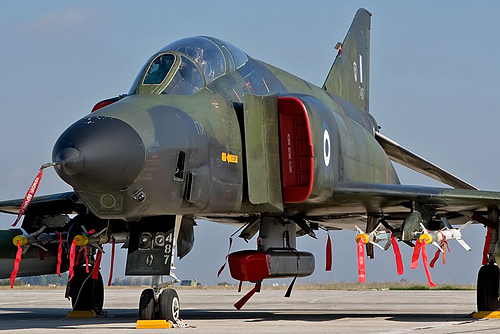 This allowed the Hellenic Air Force to build the electronic order of battle of any enemy. 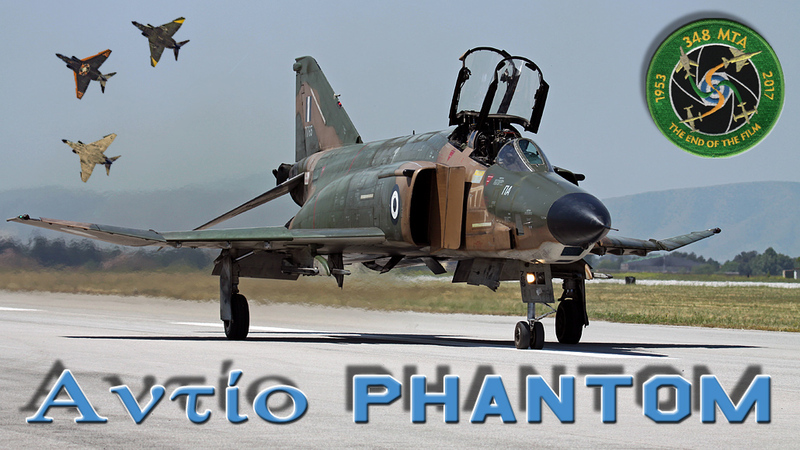 In may 2017, as the squadron was saying goodbye to the mighty Phantom II, only three airframes remained in airworthy conditions : s/n 77-1765, the last of the original batch ; s/n 69-7450, still wearing the " 60 years 348TRS " special scheme and s/n 69-7499 wearing a very attractive " The end of the film " special scheme. 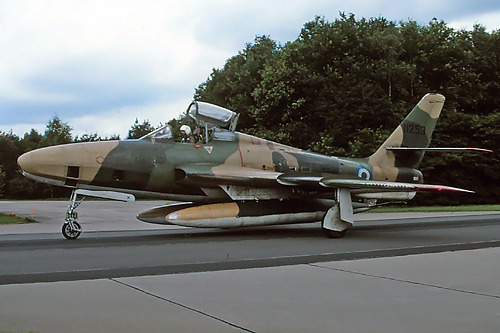 This was a tribute to this particular airframe as she was selected by the Luftwaffe as the specially painted airframe for the " Phlyout 1994 " when AG52 was disbanded. 348MTA is now in a " stand by " mode. The squadron is not officially disbanded but is not active anymore. 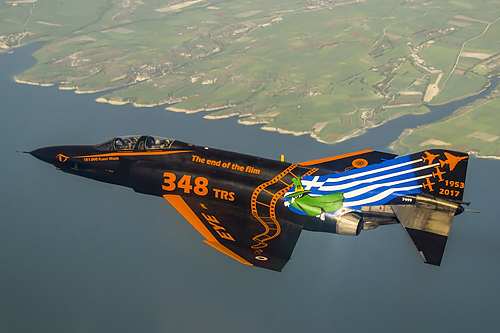 The Hellenic Air Force will not be left without reconnaissance capability as the role will be taken over by Araxos based 335Sqn with Goodrich DB-110 equipped F-16s and Andravida based 338Sqn with Litening II equiped F-4E(AUP)s.
The last three airframes will not be scrapped. S/n 77-1765 now rests in Andravida, s/n 69-7450 in Tanagra and s/n 69-7499 will join the 110CW museum in Larissa. Let's hope that 348MTA will rise again with new aircraft but, as we all know, the financial situation in Greece does not allow it at the moment. In his 64 years of existence, 348MTA flew an incredible 181.000 hours on four types of aircraft. The squadron flew 1.400 hours with the F-84G(R), 1.600 hours with the RT-33A, 80.000 hours with the RF-84F and no less than 98.000 hours with the RF-4E. SBAP would like to thank all involved for making the shooting day possible and for allowing Larissa airbase acces during this ceremony, the day organizers for sending some beautiful air-to-air pictures and Ioannis Lekkas, one of the men behind the outstanding " The end of the film " book, for helping me in writing the historic part of this text.